​Interested in the Vortex Spitfire 1x but don’t know enough about it? We are here to give you a detailed and complete review of the product. In order to help you make an informed purchase for your AR-15 scope. There are a lot of factors to consider when buying a scope. We want to make sure you have as much knowledge about the product as possible before deciding on one for yourself. To make sure you are informed of every aspect of the product, we will be covering a lot of different features. As well as comparing this scope to others that are similar in price, qualities, and how well it functions. We will hold it up to both other Vortex scopes that are offered. As well as other companies entirely to see what the best fit is for you. It is also important that you keep in mind what sort of activities . Also, practice you will be engaging in with this scope. We’ll be examining how this holds up for both short-range and longer shooting. As well to see if this measures up to what you are looking for. What is the Vortex Spitfire 1x and How Does it Work? This product is a high-quality scope specifically designed for an AR-15 by the company Vortex. It has a very vast variety of excellent features. As well as an extremely compact design that is able to withstand anything that comes its way. 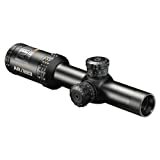 The ruggedness, convenience, and quality make this a very popular choice for a scope for your rifle. 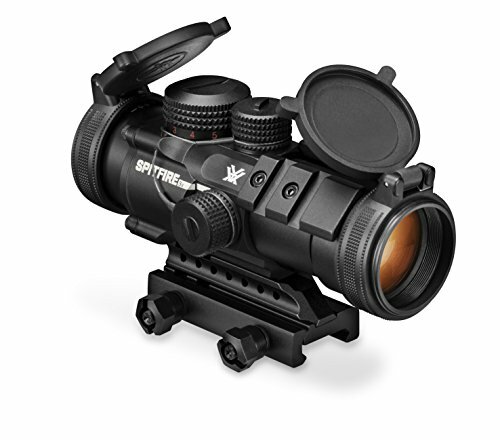 The Vortex Spitfire 1x offers several different anti-reflective coatings on any open glass surfaces of the scope. Making it a much clear view and allowing more light to transfer through. Besides to this, it also has a sharp, prism-based design to add to the clarity of the optics. The scope is constructed in such a way to make it as rugged and strong as possible. It is completely waterproof and shockproof. Also, fogproof-making it incredibly convenient for any kind of weather. The device is also rated for -22 to 122 degrees Fahrenheit. For battery usage, as it does require them. It has a battery life of about 250 hours at its highest setting, and 3000 at its lowest. You are provided with five different levels of brightness to choose from. As well as red and green illumination setting choices. Also, if your battery happens to die. Because the DRT reticle is etched directly into the glass, it is still able to be used no matter what. The mount heights are able to be changed. As well- it comes at a lower height of 40.4 mm from the optic center to the surface of the base. You are able to remove the mount riser if you want a lower 30mm height. One great aspect of this scope is the simple fact that it was designed specifically for AR-15s. Because of this, it is a lot more intuitive than other scopes that fit other guns as well. Vortex has created this scope for those shooters wanting very clear. Quick target acquisition with either their defensive or target AR platforms. You will not have issues with struggling to get your reticle lined up or problems with tunnel vision. Using this scope will allow you to react faster in a defensive situation than you may be able to with other product choices. To enable this, Vortex uses the Dual Ring Tactical (DRT) design. This means that there is a tiny ring inside of a bigger ring that assists with quick target alignment. Since your eye will be naturally drawn to follow the center. Making this a very simple solution for alignment. While these tools are created for very quick and close shots, they do very well for long range shooting as well. You are able to zero-in pretty precisely on the 100-200 yard range with one or two inch bullseye targets. For a 1x scope, this is pretty impressive and speaks well for the product. Another really great feature of this scope and all other Vortex products is their VIP warranty. No matter what you do or what happens to the scope, they will repair it or completely replace it at no charge to you at all. This awesome quality gives the purchaser great peace of mind when using their products. It is fully transferable. You are not asked to fill out a warranty card, and you do not have to keep your receipt if you need to use this warranty. The only things it really doesn’t cover are deliberate damage, loss, and misuse. The prices for this item ranges from about $249 to $349. Depending on whether you buy it straight from the manufacturer or somewhere else. Compared to other scopes with similar specs, this pricing is very moderate. Besides a fantastic deal for the high-quality features you get with this product. In this section, we will be taking a look at both the positives. Also the negatives from people who have used and reviewed this scope. We have found an overwhelmingly positive amount of views for the Vortex Spitfire 1x. Most buyers have raved about the qualities. Also, have wholeheartedly enjoyed using this product. One of the specific features that was mentioned quite a bit was the ease that the product gave to their eyesight. The ocular tuning provided a huge amount of relief. Allowing users to make both the reticle and target look sharp and nice and avoiding too much strain as they aim. Another quality that purchasers highly regarded was the enhanced reticle. Compared to scopes that only provide you with the tiny red dot, having the “donut”. The small circle with a larger one surrounding it gives the user a quicker response time for aiming and hitting their target. Speaking of the DRT reticle. A lot of users also pointed out the wonderful convenience of having it etched into the glass. Allowing you to use even in the event that your battery dies. Last but not least, users were very pleased with the price to quality ratio. This particular scope is extremely budget friendly at less than $500 dollars. Offers quite a few amazing high-quality aspects that make it a desirable tool for your AR-15. As for the negative side to buying a Vortex Spitfire 1x, we were not able to come up with a whole lot of them. The only downside that came up in reviews was simply the fact. That you cannot easily use a magnifier with the prism optics. While it is possible, the magnifier is really only recommended to use with true red dot sights. The Spitfire 1x’s etched reticle means that it also has a diopter adjustment in order to focus the reticle to your eye. The magnifier also has a diopter adjustment. Even if you are able to match the two of them up perfectly, the scope’s would be off the minute you flip the magnifier away. Again, overall the general reviews were overwhelmingly positive and definitely do a great job of talking up the product. Now, we will be taking a look at the specs and public opinion of this scope compared to other ones with similar qualities. Price ranges to see if it is truly worth your time and money. If we just compare the Spitfire 1x to the 3x, there are a few differences there. The 1x has an eye relief of 3.7, while the 3x has 2.8. The 3x is also a little heavier, at 12.2 ounces compared to the 11.2 of the other, and about an inch and a half longer. Because the Spitfire 3x is obviously able to provide three times the power. The target is shown three times closer when looking at it through this scope. This item is a bit more expensive at $350 to $450 depending on where it is purchased. Looking at scopes from other companies, there are a few differing qualities as well. ​The Primary Arms 1-6 X 24mm Hunting Scope is pretty close in price, but doesn’t have glass quite as clear as the Vortex products. Another items in this price range include the Bushnell-AR Optics 1-4X24MM Scope Drop Zone-223 BDC Reticle. Which will run you about $250 on Amazon but has been said to not truly be 1x-more like a 1.25x. As for the warranties, a lot of the companies offer a similar lifetime one like Vortex does. Burris, for example, has one that is pretty much identical. The conclusion we came to when looking at other models at similar prices and qualities is that the Vortex Spitfire 1x simply has more bang for its buck. You would be hard-pressed to find another scope that offers quite as much for what you are paying. This is absolutely a product we would recommend for your AR-15. Between the moderate, affordable price making it a viable option for most gun-owners. To the wide array of positive qualities it has-it certainly has our vote. While there are some very small shortcomings. They are made up for in the quality, ruggedness, and ease on your eyes that you will get with this particular scope. We hope this review has been able to assist you in your research of the Vortex Spitfire 1x. If you were on the fence about this product, do you think you will be purchasing it now? If you own one of these scopes, how do you feel about it? Would you recommend it to other AR-15 owners? Next articleThe Latest Vortex Strike Eagle Review Has Finally Been Revealed!